SRS DE provides hazardous solvents, cleaning chemicals health & safety tips. Your friendly site for understanding hazardous solvents, chemicals and toxic solvents. Additionally, the Flashpoint of a material is defined as the temperature at which an ignition source 1 cm from the surface of the liquid will cause ignition. With that being said, the standard method is defined by ASTM and most flash points are measured in a “closed cup” flashpoint tester. Discrepancies/disagreements are found in the literature for some substances, but the values are usually fairly close. Combustible and lower explosion limits! While generally regarded as non-flammable, and although no flashpoint can be measured by the standard method, dichloromethane (methylene chloride) has known explosive limits in air mixtures at 100C and above. Similarly, it is also known by firefighters to give flammable/explosive mixtures with air if there is a high energy ignition source or an enriched oxygen content. In other words, flammable solvents are an explosion hazard when the solvent vapor concentration in air is greater than the lower explosive limit (LEL) and less than the upper explosive limit (UEL). Below the LEL, the mixture is too lean to burn. For example, the LEL of ethyl alcohol is 3.3%. Note that this is 33,000 ppm for comparison with the permissible exposure level of 1000 ppm. In conclusion, the OSHA Permissible Exposure Limit is a regulatory limit for the concentration of a contaminant in workplace air. For instance, the values shown refer to the level as an 8h-TWA (8 hour time weighted average) unless otherwise noted, given in given in ppm (parts per million in contaminated air) unless otherwise noted. See OSHA Z-1 and Z-2 tables. Above all, the flash point increases as ethanol is diluted with water, but not real fast. Flash point of 80% ethanol/water is about 24C, and for 70% EtOH/water it’s 29C (according to Aldrich catalog). Finally, National Fire Protection Association health, flammability, and reactivity ratings. 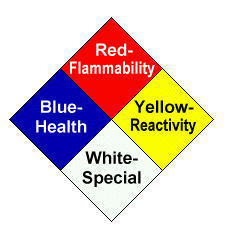 The symbol is usually referred to as the “NFPA 704 diamond.” A rating of 4 is most dangerous in any category, 0 is least dangerous. The values shown in the table above were taken from various MSDS’s and other references, and not directly from the NFPA standard (there may be discrepancies).